What Type of Restaurants Are Most Popular with Procrastinators on Valentine’s Day? RestaurantsNearMe, a fast growing company in the hyper local restaurant discovery space that reaches more than 1.5 million diners in hundreds of cities across the U.S., has released unique Valentine’s Day dining data from some of the country’s most populated cities, providing a unique glimpse into the dining behavior of people, who were apparently too busy to make a restaurant reservation prior to February 14th. Want to know what type of restaurants consumers in the U.S., who are literally waiting until the last minute to make plans, are seeking out on Valentine’s Day? Interestingly, those who were searching for a restaurant after 9:00 p.m. local time and who were dining alone would more often seek out 'American Style Dining' experiences. Sadly, these are often restaurants with more fatty and indulgent entrée and desert menu options. RestaurantNearMe surmises that individuals dining alone or with a single, platonic friend on Valentine’s Day may have a higher propensity to seek out comfort foods. This might help explain the recent Valentine’s Day food choices of celebrity pals Jennifer Lawrence and Aziz Ansari. According to RestaurantsNearMe, the two most commonly searched cuisine types on any other day of the year are by far Chinese and Mexican. However, on Valentine’s Day, those two types of cuisines are two of the least popular, which may be attributed to the fact that on the most romantic day of the year, you may be less willing to dine in a restaurant where the delicious smells of food attach themselves to your clothes. If you have ever gone to hibachi and then tried to get close with that special someone later on, you'll know precisely what they're getting at. RestaurantsNearMe is a unique, advertisement-free website that is used by U.S. consumers, who are directly searching the web for restaurants within close proximity, most often from a mobile device. In just a few years, the search term "restaurants near me" has skyrocketed in popularity to become the number one way consumers find a restaurant online. According to Google, the term is searched more than 4 million times a month. In July and August, the time when many families are traveling on vacation and likely in an unfamiliar area, search volume exceeded 5 million per month. In fact, that method of finding a restaurant has become so popular year-round that "restaurants near me" is searched nearly 1 million times more per month than the search term "restaurants", which was previously the standing record holder. Within the last few years, consumer behavior has shifted dramatically and now most individuals, who want to physically purchase goods or services locally, are appending "near me" to whatever it is they are searching for online. According to dining and hospitality industry sources, millennials, who are often the early adopters of similar digital behavioral trends, have made "restaurants near me" their go-to term when it comes to restaurant discovery. In fact, it is believed that when a millennial finds a restaurant with the search term "restaurants near me" more than 60% of the time they end up at that restaurant within an hour. Hyper local search, which is the term used to describe this specific consumer search behavior, is a very powerful way to manage "customer supply chain logistics" for many businesses. Put another way, businesses who can effectively tap into hyper local search can oftentimes bring more customers into their stores, who are ready to purchase almost on demand. This trend also explains why the cost associated with a "near me" search are often more than 50% higher on a cost per click basis. RestaurantsNearMe, which is currently in Beta, is no stranger to conducting unique research into consumer behavior when it comes to dining. Over the summer they tested out a feature on the website that would allow consumers to request a car service or taxi to pick them up and take them to their restaurant of choice. What RestaurantsNearMe found was that, on average, more than 20% of consumers would click on the 'Get A Ride Here' button if they lived in areas with high levels of traffic and parking issues. The average cost of that ride was between $10 and $15 dollars. These results should not be surprising because, thanks to "hyper local search", consumers don't often want to travel far from their home or workplace to get food. RestaurantsNearMe also found that restaurants featuring a more substantial mixture of higher alcohol content, microbrew beers, as well as specialty drinks and cocktails and a menu selection often associated with a gastro-pub fare, received an even higher percentage of ‘Get A Ride Here’ requests. 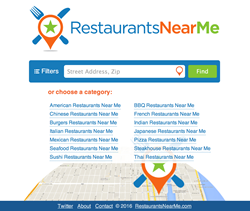 RestaurantsNearMe.com is based out of West Palm Beach, Florida.